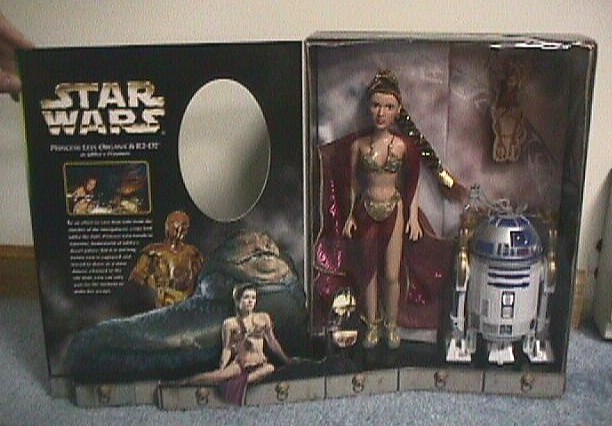 Those of you who received FAO Schwartz's advertisement postcard for their exclusive 12" Leia Slave Girl doll might recall that the figure shown on the postcard looked a good deal different from the one that was actually released. Specifically, it had a different head. Above you see a boxed sample of this early doll. Here's a closeup of the first version of the head. As you can see, the face is considerably slimmer than that of the released doll, the hair line is different, and the eyes are much larger. According to the owner of this piece, this sculpting was deemed too "Disney-like" by Hasbro (or perhaps even by FAO) for release; and one would be hard pressed to deny a vague resemblance to some of Mattel's many dolls representing animated Disney heroines. This early head, by the way, is not a hand-made piece; its made of rubber, having been roto-cast just like any other Hasbro doll head. For the sake of comparison, here's a closeup of the released doll's head. Personally, I think the earlier versoin is superior. 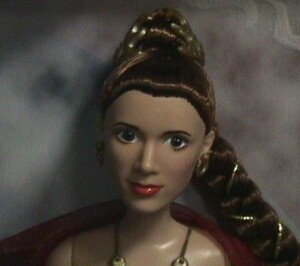 Neither looks exactly like Carrie Fisher, but this later sculpt looks a little malformed, in my opinion.